Song is slow, wheezy “I am so la-zee,” with the last note higher. 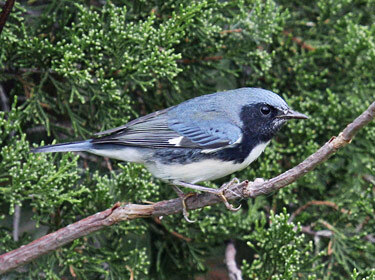 Description: Male has black throat, cheeks, and sides; blue upperparts; white underparts; bold white patch at base of primaries. 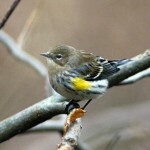 Female is dramatically different, with brownish-olive upperparts; buffy underparts; distinct pale eyebrow on dark face; and small to absent buffy wing patch. Behavior: Usually forages in lower or mid-level branches. 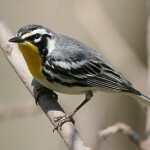 Habitat: Migrants found in low shrubby areas, such as woodlands, parks, and residential gardens. 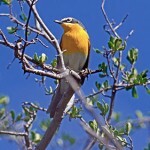 Where in Nebraska: Rare spring and fall migrant statewide. Observed at least 3 times in Douglas-Sarpy, Lancaster, Adams, and McPherson Counties. Seen as far west as Garden and Scotts Bluff Counties.